Hippo Flambé: Strawberry Freezer Jam Workshop! This Wednesday, June 13th, from 7 to 8 pm I will be teaching a workshop at Buttered Noodles on making strawberry freezer jam. Freezer jam is a great way to capture the brief Vermont strawberry season for the rest of the year. 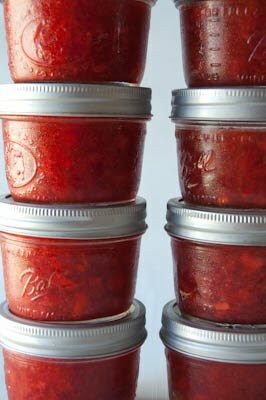 Strawberries are the only fruit I don't preserve in a traditional jam because I prefer the uncooked strawberry flavor. Plus this jam is such a staple in my house and the season is so brief I am not sure I could make enough cooked jam to last more then 2 months. After the workshop all participants are welcome to shop with a 10% discount (very few items are excluded from the discount).